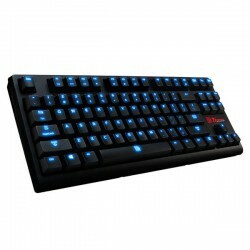 + The POSEIDON ZX Illuminated - Blue/Brown Switch Edition - is a budget friendly mechanical keyboard in the tenkeyless form factor. Perfect for a gamer to use at home or lan where space is more limited. The POSEIDON ZX features TteSPORTS Certified Mechanical switches, rated for 50 million keystrokes, with the world’s first 5 Year Warranty for mechanical gaming keyboards.